The Toro TMC-212 irrigation timer keeps your sprinkler system on a consistent watering schedule. 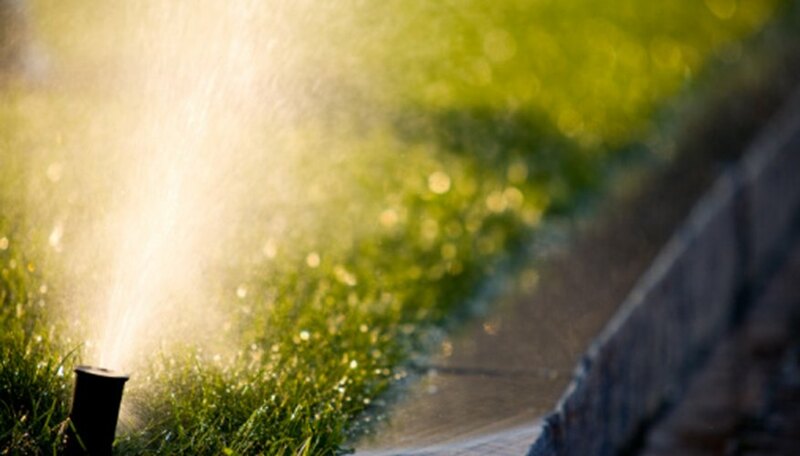 The timer is connected to valves and sprinklers and, when activated, the sprinklers rise up and water your lawn and garden. The control panel features a dial, a program switch, navigation buttons and a liquid crystal display. After the TMC-212 is installed, you might have questions about how to program it. Twist the TMC-212 dial to Watering Days and switch to the program for which you would like to set intervals. The currently scheduled days are displayed. Press Next. The current interval flashes. Push the On or Off button to change the interval number (1-7). Push Next. Push the On or Off button to change the interval start day. Repeat the process for each program. Twist the dial to Watering Days to set an even or odd day schedule. Select the desired program. The currently set watering schedule appears. Push the On or Off button until “Odd” or “Even” appears as you wish. When “Even” is selected watering occurs on even days of the month. When “Odd” is selected, watering occurs on odd days of the month, excluding the 31st and February 29. Twist the TMC-212 dial to “Watering Days” to turn off a program. Select the program you wish to turn off. Push the On or Off button until “Off” flashes. Repeat the process for each program as desired. Twist the dial to “Start Times” to begin scheduling start times for each program. Select the program you wish to schedule. Start time “1” flashes. Push the On or Off button to increase or decrease the displayed start time. Push the Next button to schedule up to three more start times for each day.